This pattern is intended for personal use only. Please do not reproduce or repost this pattern without my permission. Never sell my patterns or items created from my patterns. Probably the most complicated parts of this pattern are the muzzle and tail. 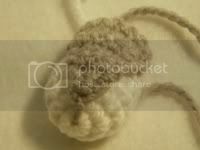 The head and body are the typical amigurumi "mushroom" shape and the paws and ears are pretty simple to crochet. The finished size of the wolf is about 5 inches sitting, 7 inches standing. Rnd 3: [2 sc in next st, sc 3] three times (15 sts). Rnd 4: sc around (15 sts). Rnd 5: sc around (15 sts). Rnd 6: sc around (15 sts). Rnd 7: [sc2tog, sc 3] three times (12 sts). Rnd 8: [sc2tog, sc 2] three times (9 sts). Bind off, leaving yarn tail to sew muzzle to head. Row 1: ch 2, 2 sc in second chain from hook, ch 1 turn (2 sts). Row 2: sc across, ch 1 turn (2 sts). Row 3: 2 sc in each st, ch 1 turn (4 sts). Row 4: sc across, ch 1 turn (4 sts). Row 5: 2 sc in 1st st, sc next two st, 2 sc in 4th st, ch 1 turn (6 sts) . Row 6: sc across, ch 1 turn (6 sts). Row 7: sc across, ch 1 turn (6 sts). Bind off, leaving tail to sew blaze onto muzzle. Sew blaze on top of muzzle, with short end of blaze positioned just above the point of the muzzle. 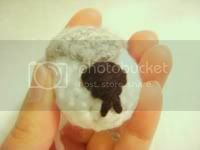 Use black yarn to embroider nose over end of blaze or attach plastic safety nose. Stuff the muzzle. Rnd 3: [2 sc in next st, sc 2] two times (8 sts). Rnd 4: [2 sc in next st, sc 3] two times (10 sts). Rnd 5: [2 sc in next st, sc 4] two times (12 sts). Rnd 6: [2 sc in next st, sc 5] two times (14 sts). Bind off, leaving long tail. Use tail to sew open end of ear together so it is flat (do not stuff). Leave excess tail to sew ear to head. Rnd 11: sc around (30 sts). Rnd 12: [sc2tog, sc 3] six times (24 sts). Rnd 13: [sc2tog, sc 2] six times (18 sts). Rnd 14: [sc2tog, sc 1] six times (12 sts). Rnd 15: [sc2tog] six times (6 sts). Rnd 16: sc around (6 sts). Rnd 17: [2 sc in next st, sc 1] three times (9 sts). Rnd 18: [2 sc in next st, sc 2] three times (12 sts). Rnd 19: sc around (12 sts). Rnd 20: sc around (12 sts). Rnd 21: [2 sc in next st, sc 3] three times (15 sts). Rnd 22: sc around (15 sts). Rnd 23: [sc2tog, sc 3] three times (12 sts). Rnd 24: [sc2tog] three times (6 sts). Stuff body. Bind off and close hole. Rnd 5: [sc2tog, sc 2] three times (9 sts). Rnd 7: [sc2tog, sc 1] three times (6 sts). Rnd 8: sc around (6 sts). Rnd 9: sc around (6 sts). Bind off, leaving long tail to sew paw to body. Stuff paw and sew opening shut. Rnd 6: [sc2tog, sc 3] three times (12 sts). Rnd 11: [sc2tog, sc 1] three times (6 sts). Rnd 12: sc around (6 sts). 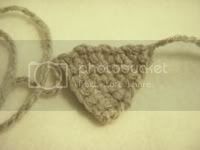 Note: The tail is crocheted with most of the increases on one side of the tail and most of the decreases on the other so that it will have a curve. Rnd 2: sc across (4 sts). Rnd 3: [2 sc in next st, sc 1] twice (6 sts). Rnd 4: 2 sc in next st, sc 1, sc2tog, sc 2 (6 sts). Rnd 5: 2 sc in next st, sc 5 (7 sts). Rnd 6: 2 sc in next st, sc 6 (8 sts). Rnd 7: 2 sc in next st, sc 2, sc2tog, sc 3 (8 sts). Rnd 8: 2 sc in next st, sc 2, sc2tog, sc 3 (8 sts). Rnd 9: 2 sc in next st, sc 2, sc2tog, sc 3 (8 sts). Rnd 10: 2 sc in next st, sc 7 (9 sts). Rnd 11: 2 sc in next st, sc 8 (10 sts). Rnd 12: 2 sc in next st, sc 3, sc2tog, sc 4 (10 sts). Rnd 13: 2 sc in next st, sc 3, sc2tog, sc 4 (10 sts). Rnd 14: [sc2tog, sc 3] two times (8 sts). Bind off, leaving long tail to sew tail onto body. Stuff tail. Sew front paws on to body below the head. Sew back paws near the bottom of the body. Sew the tail on the back side of the body between the back paws. If wanted, use black yarn to embroider claws on to each paw.